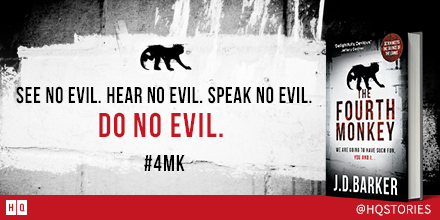 I am delighted to be today's stop on The Fourth Monkey blog tour. The Fourth Monkey is set to be one of the top books of 2017 and I fully expect to see it on the big screen in the not too distant future. For my stop on the tour, I am re-releasing my review and I have a fabulous giveaway that's open to both UK and US entrants so do make sure to enter at the end of the post. Usually I would give buy links at the end of my review but you really need to read this book so BUY IT NOW!!! Click one of the links below, depending on wherever you are in the world. As the lead investigator Detective Sam Porter knows even in death, the killer is far from finished. When he discovers a personal diary in the jacket pocket of the body, Porter finds himself caught up in the mind of a psychopath, unraveling a twisted history in hopes of finding one last girl, all while struggling with personal demons of his own. This is seriously going to be the most talked about books of the year! We've all heard of the 3 wise monkeys: see no evil, speak no evil and hear no evil, but how many people know about The Fourth Monkey: do no evil? I think my love of the TV show Dexter set me up nicely for The Fourth Monkey. If you have watched Dexter, imagine reading his diaries in glorious technicolor and you will be close to my experience of The Fourth Monkey. Even one of the detectives, Clair, reminds me of Dexter's foul-mouthed sister, Deb. 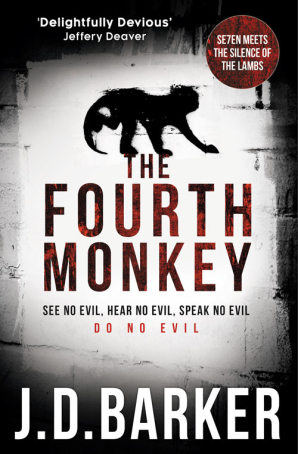 The Fourth Monkey is one of those books that is hard to review without giving anything away, so the least said, the better. Suffice to say it positively glues your eyes to the page as you clamour for every detail. Nothing is quite what it seems, so welcome to the Brain-bender Olympics! I loved the flashbacks to the past which flowed effortlessly within the story, again I go back to the Dexter element as seeing the killer as a young boy, you can't help but feel empathetic towards him. It's probably the police's best dream and worst nightmare when the body of such a high profile serial killer is found but he takes with him the secret of the whereabouts of his last victim who is possibly still alive. Cue the ticking timer as the police race against time to find out who the killer was and where he could have kept his latest victim before she runs out of food and water. This sets the fast pace of the book and I was torn between wanting to find the latest 4MK victim and finding out the 4MK killer's story. Where there is a past and present element to a book I always tend to favour one above the other but in this case I couldn't get back to each one fast enough. Superbly written, The Fourth Monkey is one hell of a ride. I read it so fast I think I need to read it again to fully appreciate the brilliance of the story. If this isn't made into a film, Hollywood needs its head examined. Giveaway time! 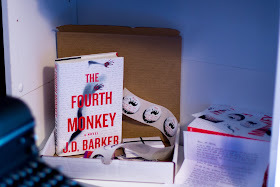 Do you want to win this amazing The Fourth Monkey #4MK Killer Swag Bag that includes a hardback copy of The Fourth Monkey along with other surprise goodies? Enter on the Rafflecopter below - GOOD LUCK! Heard such excellent things about this book!